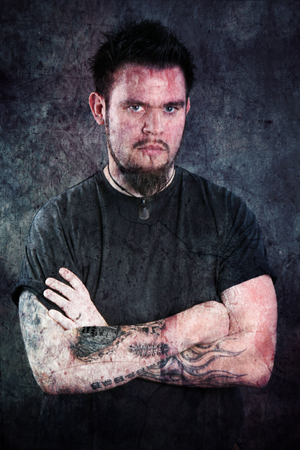 DRAGGING THE CASKET was founded during the beginning of 2011 by guitarist L-G Hakamo (guitars/programming) of Swedish death/thrash outfit ARISE. Inspiration comes from thrash bands such as Exodus, Testament, Kreator and Destruction although the background from the Gothenburg melodic death metal scene is present in the music as well. Instead of going the traditional path of recording a demo, sending it out to record labels to get the financial help to going into a real recording studio everything was done from home. Comments L-G: “Being on somewhat of an hiatus from ARISE after re-locating to Helsinki, Finland a couple of years ago I once again started to enjoy playing and writing heavy music. I could write a complete song in a couple of hours and then spend two weeks mixing it, tweaking things, re-recording some stuff, writing lyrics and recording guide vocals. I basically learnt mixing while doing this album“. When teaming up with Jonatan Storm on vocals an important piece in the puzzle was filled. His well-executed screams and fast feedback turned out to fit the project perfectly. “I had mostly been concentrating on writing the music so I was somewhat behind with the lyrics when I got in touch with Jonatan. But his enthusiasm for the project got me to balance the work and he actually drove me to make complete songs instead of just guitars and drums“, L-G comments. The debut album “The Undead” was released for free on 6.6.2011.